JW Marriott Hotel Seoul's Chinese restaurant, 'Man Ho,' brings one of China's best-loved cuisine to Seoul with its Sichuan Promotion from May 1-June 30, 2006. Sichuan, a province in central-western China, boasts one of the country's eight regional cuisines and is characterized by its mixture of pungent, salty, sweet and sour flavors. 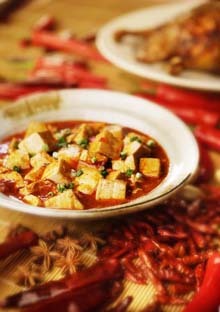 Many of the dishes use garlic and Sichuan's native peppercorn, or "huajiao," giving the cuisine a reputation for delivering a fiery kick. Our chef can replicate these authentic flavors or tone them down on request to suit your tastes. Signature dishes of the Sichuan Promotion include, among others, stir-fried mixed seafood with chili sauce in hot pot, Sichuan tea-smoked duck, and braised bean curd with hot sauce, each of which is served as part of a three-course menu. Using authentic ingredients from the region, each dish on the Sichuan Promotion menu offers high levels of vitamins A, B and C. These have been proven to bolster the immune system and support the growth of healthy cells, among other beneficial properties. The dishes also feature lower calories and less fat than standard Chinese cuisine, making them both delicious and healthy. In addition to its stimulating menus and eye-catching décor, Man Ho offers seven rooms for family gatherings, business functions or simple get-togethers to add an extra touch of privacy. Enjoy both classic dishes and innovative recipes that our chef has created focusing on this spicy and health-conscious cuisine from the heart of China. The Lunch Set Menu is priced from KRW60,000-110,000, while the more extensive Dinner Set Menu offers the pick of the region's 5,000 dishes in the KRW110,000-150,000 price range*. For further information please contact: 02-6282-6741. Man Ho is located on the Lower Lobby (LL) of the JW Marriott Hotel Seoul. *Tax and Service charges are not included.